As I write on Thursday afternoon, I recall the second lesson, which I read today at Morning Prayer. It was the lesson known by most of us as the Parable of the Prodigal Son, Luke 15:11–32. I think it was in one of the training courses for the Catechesis of the Good Shepherd that I heard it called the Parable of the Forgiving Father. This morning a phrase caught my attention as I was reading —I’m pretty sure for the first time. 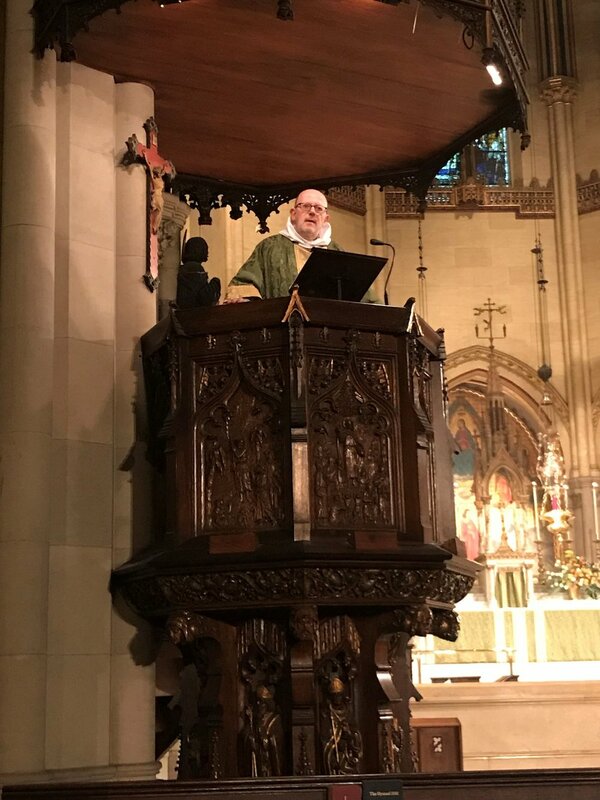 Father Jay Smith was celebrant and preacher for the Solemn Mass on November 11, 2018. One reason the parable is so powerful is the forgiving love that springs from the father’s heart. Luke’s Jesus puts it this way, “But while [the son] was yet at a distance, his father saw him and had compassion, and ran and embraced him and kissed him” (Luke 15:20b). The son does not expect this response; he’s come home, expecting only to be a hired hand. Yet, this is the father’s response, “Let us eat and make merry; for this my son was dead, and is alive again; he was lost, and is found” (Luke 15:23b–24a). This is, for me, familiar, as is the concluding part of the narrative in which the elder son is upset (and I am an eldest son). He had remained at home, working with and for his father. When his father learns that this son refused to join in the celebration for the return of the younger, what I found myself hearing, in a sense, for the first time, were these words, “His father came out and entreated him” (Luke 15:28b). Again, “His father came out.” I think our heavenly Father comes for us more often than we are aware. God comes after us. The Catechesis of the Good Shepherd begins with the conviction that the Holy Spirit is truly present in the life of every person from the beginning of his or her life. By studying the gifts and development of the child, the catechesis seeks to provide an environment in which the child can work on his or her relationship with God. Again, the relationship is already there —and it is ongoing until the day of death and beyond. It’s been a while since I’ve reflected on my relationship with God in terms of God seeking me out. But I well remember the power and importance of a moment in my early twenties when I had come to think that my presence or absence didn’t matter to anyone. When things seemed dark, I became aware that I mattered to Jesus. And I’m still here, working on my relationship with God and with others. YOUR PRAYERS ARE ASKED FOR Steve, Ricardo, Kenny, Jondan, Michelle, Paul, Frank, MaryHope, José, Eloise, Michael, Donald, Alexandra, James, Karen, Susan, Marilouise, Greg, Timothy, Barbara, Dennis, Abraham, Randy, Burton, May, Heidi, Takeem, David, and Sandy; and Horace, Clayton, Gaylord, Louis, and Edgar, priests; and all the benefactors and friends of this parish. GRANT THEM PEACE . . . November 18: 1884 Bertha Bageley; 1915 Rose Anna Gallagher; 1933 John George Rappel; 1951 Siberta Henrietta Carter. STEWARDSHIP CAMPAIGN 2018–2019 . . . Our campaign and pledge drive have begun, and pledge cards are beginning to arrive in the mail. Some statistics may be helpful. We mailed packets to 124 households that pledged last year and to 673 households that have expressed an interest in supporting the parish. We also, for the first time, sent a separate appeal to 157 households that have made donations in the past, but have not made a pledge. We have asked those donors to consider making a regular, periodic sustaining donation to Saint Mary’s. Once again this year, our goal for the campaign is $425,000. As of November 13, we have received $136,530 in pledges from 28 households, 32.1% of our goal. We obviously have a ways to go, but this is a decent beginning. We encourage all the friends and members of the parish to return their pledge cards by the end of November. This will help the Budget Committee in their work. However, if making a commitment by that date is not possible, we will gladly receive pledge cards at any point during the coming year. Our needs are urgent. Our mission is clear. We invite your support. The Shrine of the Sacred Heart. THIS WEEK AT SAINT MARY’S . . . Sunday, November 18, The Twenty-sixth Sunday after Pentecost: Sung Matins 8:30 AM, Mass 9:00 AM, Adult Forum led by Father Peter Powell 10:00 AM, Mass 10:00 AM, Solemn Mass 11:00 AM, Solemn Evensong & Benediction 5:00 PM . . . Wednesday, November 21, Eve of Thanksgiving Day, Sung Mass 6:00 PM. The Bible Study Class does not meet Thanksgiving Eve . . . Thursday, November 22, Thanksgiving Day, Noonday Prayer 12:00 PM, Sung Mass 12:10 PM . . . Friday, November 23, 6:30 PM, Centering Prayer Group, Atrium, Parish Hall, Second Floor. ADVENT QUIET DAY . . . Saturday, December 15, 9:30 AM–3:00 PM. Led by Brother Thomas and Brother Damien, the Quiet Day will be centered around the stories of Advent. Using icons depicting scenes from the narrative of the Advent season, participants will be invited to engage in a guided process of discussion and prayer meditation. Using the process of lectio divina in the context of icons, participants will have the opportunity to explore the images and texts of the stories of the Annunciation, the Visitation, and the Nativity in hopefully a new and prayerful way. The brothers will be discussing the use of icons, some of the symbolism within each image and then lead the participants through the lectio divina process for each image. All are welcome. A donation of $10.00 to cover the costs of breakfast and lunch is welcome. Please RSVP by sending an e-mail to Father Jay Smith. CHRISTIAN EDUCATION . . . Sundays in November at 10:00 AM, Father Peter Powell will lead the class in a discussion of the Elijah/Elisha cycle in 1 Kings 16:23–2 Kings 13:25 . . . Sunday, December 2 and 9, at 10:00 AM, resident iconographer, Zachary Roesemann leads the class in a discussion of the theology of the Incarnation in light of some of his recent work. The Adult Forum meets in Saint Benedict’s Study . . . The Wednesday Night Bible Study Class meets next on November 28 at 6:30 PM. The class is reading the Letter of James and is led by Father Jay Smith. AROUND THE PARISH . . . Last weekend, Saint Mary’s delegates, clerical and lay, attended the diocese of New York’s annual convention, which this year took place at the Crowne Plaza Hotel in White Plains. A summary of the convention’s work is available on the diocesan website. This involved the election of representatives to various diocesan committees, the approval of a budget, and the passing of a number of resolutions. These included the admittance and seating in convention of several new or re-constituted parishes. On Friday afternoon, delegates attended a workshop focused on racism and watched a theatrical piece concerning the complicated history of racism in the diocese in the nineteenth century. 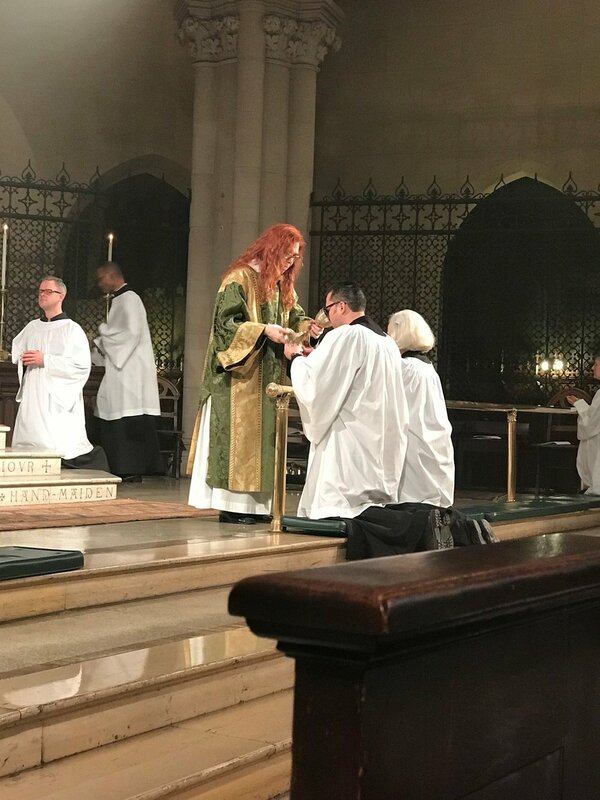 On Friday evening, Jeannine Otis, the director of that play, was awarded the Bishop’s Cross. The Bishop’s Cross was also awarded to Bruce J. Macleod, Jr., chairman of the cathedral’s board of trustees, and to Douglas B. Stevenson, Esq., who volunteers for the Seamen’s Church Institute and leads the Center for Seafarer’s Rights . . . We hope to receive donations for altar flowers on the following dates: Sunday, January 13, 20, and 27, February 10, 17, 24, and March 3. If you would like to make a donation, please contact the parish office . . . Attendance: Last Sunday 182. FROM THE MUSIC DIRECTOR . . . At the Solemn Mass on Sunday, the setting of the Mass ordinary is the Mass for Four Voices of William Byrd (c. 1540–1623). Byrd composed settings of the Latin Mass for three, four, and five voices. The Mass for Four Voices dates from about 1592 and was probably the first of the three to be composed. The whole business of Latin Masses in post-Reformation England needed to be a somewhat clandestine matter to protect those involved from the possibility of arrest. This being the case, Byrd’s part books were undated and without title page or preface, nor was the printer (Thomas East) identified. Fortunately, Byrd’s settings survived the period in which their performance —if not their very existence —was illegal, and they are now rightly regarded as great treasures of Western music. Although composed with the Continental Tridentine liturgy in mind, Byrd’s Mass for Four Voices was also influenced by the pre-Reformation Mean Mass of John Taverner (c. 1490–1545), particularly in the opening of the Sanctus. The older Taverner setting had already served as a model for settings by English masters Christopher Tye (c. 1505–c. 1573), John Sheppard (c. 1515–1558) and Thomas Tallis (c. 1505–1585). Byrd’s four-voice Agnus Dei ends with a particularly expressive Dona nobis pacem. Deacon Rebecca Weiner Tompkins was with us. Servers seated in the chancel and ushers are among the last to receive Communion. The Communion motet on Sunday is a four-voice setting of O Sacrum convivium by Olivier Messiaen (1908–1992). The text O sacrum convivium, often attributed to the great theologian Thomas Aquinas (1225–1274), found a home in the Roman liturgical cycle. It is the antiphon for Magnificat at second Vespers of Corpus Christi but is very much at home in any Eucharistic celebration. It has been set in Latin, as well as in vernacular translations, by distinguished composers of every generation. Olivier Messiaen is widely regarded as one of the most original voices among twentieth-century composers. Born in Avignon, son of the poetess Cécile Sauvage, he was a student of Marcel Dupré and Paul Dukas at the Paris Conservatory where he became professor of musical analysis, philosophy, and aesthetics in 1942. His legendary tenure as titular organist of Trinité, Paris, began in 1931, six years before he composed O Sacrum convivium. This four-voice motet has the rhythmic flexibility of chant and, although dwelling in the orbit of F-sharp major, is formed in Messiaen’s expansive harmonic vocabulary, pushing beyond standard tonal conventions in expressing the text. Sunday’s organ voluntaries are two strikingly different fantasias based upon Luther’s choral Ein feste Burg ist unser Gott (“A mighty fortress is our God”). Both are by German composers but were composed more than two centuries apart. The prelude is a setting by Dieterich Buxtehude (1637–1707) and representative of his highly cultivated art of chorale embellishment. Buxtehude’s organ chorales are relatively free of the self-conscious formal and contrapuntal mechanics which distinguish the great chorale preludes of Bach, but rather lean more toward a style of improvisation which delights in the chorale melody itself and in the musical colors and textures possible on the organ. The present setting of Luther’s Ein feste Burg is typical of his chorale preludes in ornamented melody style. An embellished form of the chorale melody is played, phrase by phrase, in the uppermost voice with accompaniment in two voices and pedal beneath. A view of the nave from the Thomas McKee Brown cenotaph. OUTREACH AT SAINT MARY’S . . . Donations and volunteers are needed for our next Drop-in Day on Wednesday, November 28, and for the many requests for assistance between Drop-in Days. We are in particular need of basic items such as the following: packs of new underwear in various sizes for both men and women; slacks for both men and women, including jeans, chinos, khakis, etc. ; packs of new socks, white and black; rainwear; knapsacks; and toiletry articles. Please contact Brother Damien Joseph, SSF, if you would like to volunteer for this important ministry or if you would like to make a donation . . . We continue to receive nonperishable food items for our outreach partner, Saint Clement’s Food Pantry. Please place those items in the basket near the ushers’ table at the Forty-sixth Street entrance to the church. We are very grateful to all those who continue to support this ministry. CONCERTS AT SAINT MARY’S . . . Saturday, December 8, 8:00 PM, New York Repertory Orchestra, Anton Bruckner: Symphony No. 8. LOOKING AHEAD . . . Sunday, November 25, Last Sunday after Pentecost and Commitment Sunday . . . Sunday, December 2, First Sunday of Advent . . . Friday, December 7, Eve of the Conception of the Blessed Virgin Mary, Organ Recital 5:30 PM, Solemn Mass 6:00 PM . . . Wednesday, December 12, The Anniversary of the Dedication of the Church, 1895 . . . Sunday, December 16, The Third Sunday of Advent: The O Antiphons begin . . . Friday, December 21, Saint Thomas the Apostle, Mass 12:10 and 6:20 PM.